The Rabbi with a Blog (Rabbi Jason Miller): Should Rabbi Natan Tzvi Finkel Have Mattered More to Us? Should Rabbi Natan Tzvi Finkel Have Mattered More to Us? I try to keep up with the current events of the worldwide Jewish community. I read all of the major Jewish newspapers (or at least their websites). Therefore, I knew when Rabbi Natan Tzvi Finkel died on November 8 in Jerusalem. And yet, I admit I had never heard of him before. Rabbi Finkel was born in Chicago, Illinois and was the Rosh Yeshiva of the Mir Yeshiva in Jerusalem. While I'm sure he's included in the set of famous rabbi trading cards I occasionally receive as a gag gift, I had never read anything he had written or listened to any of his sermons on YouTube. I immediately knew he was a "tzaddik" (righteous man) and a "gadol hador" (an influential giant of his generation) because over 100,000 people attended his funeral. I will be the first to admit that his death didn't affect my life and after reading the headline of his death I said "baruch dayan ha'emet" and went on about my day. 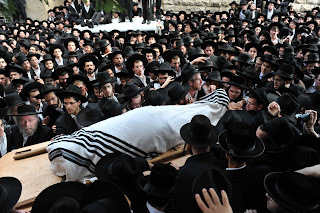 The funeral of Rabbi Natan Tzvi Finkel, the Rosh Yeshiva of the Mir Yeshiva in Jerusalem. What a striking difference! 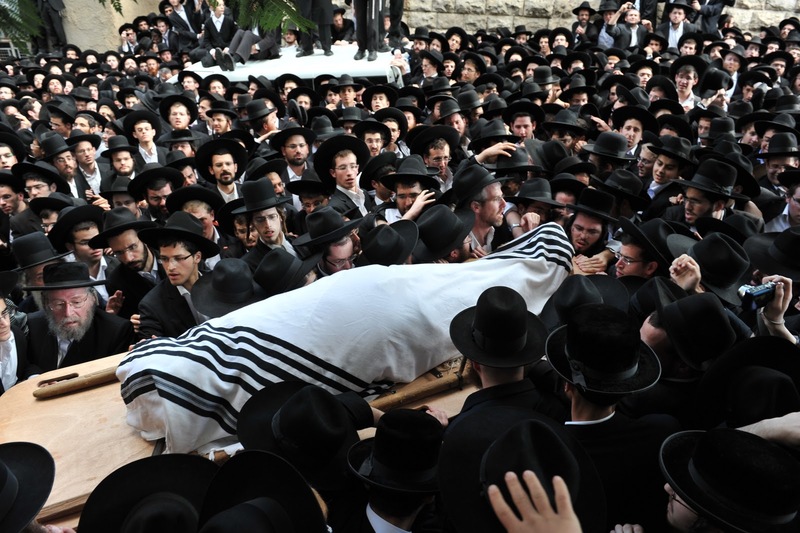 How many secular Jews could be found at Rabbi Finkel’s funeral? How many observant Jews not in black? None of the former, I would imagine. And very, very few of the latter. Which leads me to the following question: Who is there anywhere in the Jewish world whose passing would evoke the sense of shared loss that was felt when Peretz died? Is there anyone in the Jewish world – in Israel, the United States, or anywhere else – who would be mourned by secularists and religious Jews alike, conservatives and liberals, Zionists and those more dubious about the Jewish state? And that got me thinking. Who is there who could die and be mourned by over 100,000 Jewish people representing every political and religious group? I immediately thought back to this month in 1995 when we mourned the death of Israeli Prime Minister Yitzhak Rabin. That might have been the death of the term "worldwide Jewish community." Rabin's assassination was carried out based on political and religious disagreements. The harsh reality is that the global Jewish community is more divided today than ever before and Gordis's use of these two funerals paints that picture in sharp detail. Gordis has a strong message for us. He writes, "What matters, of course, is not really who mourns whom at funerals. What matters is who takes whom seriously during their lifetime. And increasingly, I fear, we take seriously those people who are more or less like us. We embrace (and then 'like' on Facebook, or forward to others) the views of those with whom we agree, and disparage (and don’t 'like' or Retweet, and never forward) the views of those whose views we don’t share." Gordis encourages us to read those individuals whose opinions we don't agree with. Perhaps the non-Haredi community would never have turned out en masse to mourn the passing of Rabbi Natan Tzvi Finkel earlier this month, but at least we should have known who he was and why he was such a notable figure among some of our brothers and sisters.